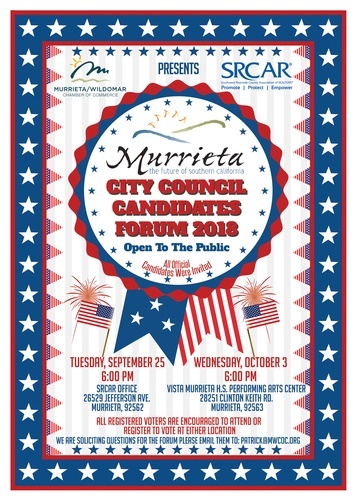 Please join us for Murrieta City Council Candidates Forum #1 held at the Southwest Riverside County Association of Realtors (SRCAR) Office at 6:00pm on September 25th. We are committed to providing an opportunity for voters to educate themselves on the different candidates running for City Council this year in Districts 1, 2 & 5. This is open to the public and SRCAR is providing the opportunity to register to vote. Please share, your vote matters! This event is open to everyone looking to make an informed vote!